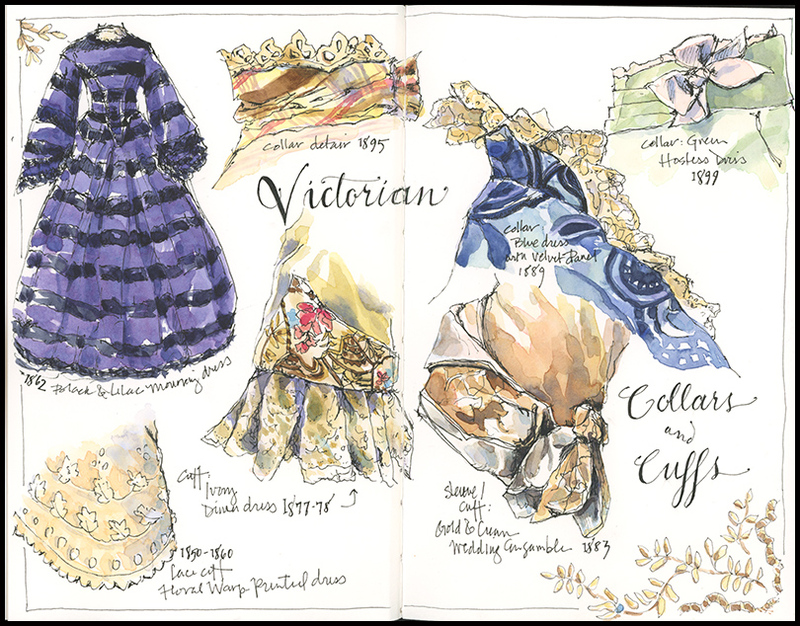 How does a naturalist-artist find herself painting Victorian dresses? I’m not sure, except that I found the fantastic fabrics and fine details of the new exhibit Well Dressed in Victorian Albany quite irresistible. The gowns in the collection of the Albany Institute of History & Art are so exquisite, they make perfect artistic subjects. Unfortunately, the museum didn’t allow watercolor in the gallery, so I was restricted to pencil and pen, and had to paint later…which took away a bit of the fun. Nevertheless, this was a valuable exercise. Painting drapery requires mastery of line, volume, form, and value. I went for a fairly graphic look, with bolder blacks for the darkest areas. Had I been able to paint initially, I probably would have skipped the bold lines in favor of more subtle watercolor. I was particularly drawn to the incredible details of collars and cuffs. I wanted to see what I could suggest without painting every stitch of lace or embroidery. 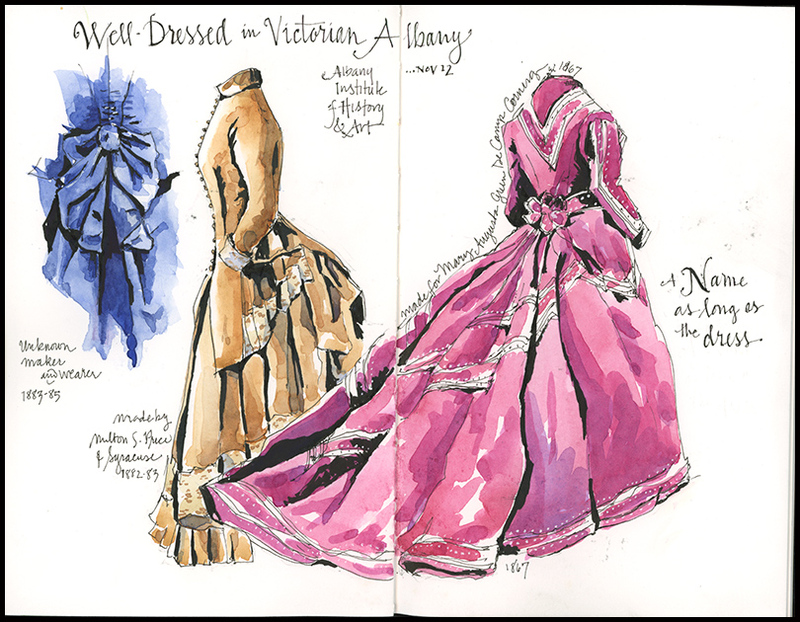 This entry was posted in Journal and tagged #VictorianAlbany, museum sketching, Victorian dresses, watercolor sketch by Jean Mackay / Drawn In. Bookmark the permalink. Oh, I just looked back at your site, and found that you are indeed from my neck of the woods. Beautiful work! How fun to make that connection. I’m close to the Columbia Co line now, but used to live at the base of the Helderbergs. All good. Thanks Susan– I appreciate it! Your drawings are beautiful. It really makes me think – are we all so different from the women who wore these beautiful dresses? I know these were probably worn by wealthy women, but even a taste of some of this beauty seems so far removed from today. Whoa Jean. You are a serious talent! Just beautiful. Thanks Dari! You should go see this exhibit…you’d enjoy it. Great questions Debbie- these dresses really make you curious– about the women who wore them, about the history of women (and clothing), and about how anyone functioned doing day to day activities wearing dresses like this! It might be good for us all to dress so beautifully– just once! They actually told me “pencil only”– but these just aren’t pencil dresses! I did take some photos for color reference…so it’s not just having an eye/memory for color. I would have loved to start with a big loose wash! Always good to go down a different road once and a while…absolutely gorgeous! It is good to “sharpen the saw” by tackling different things and taking different approaches. I really enjoyed this. You’ve outdone yourself, these are wonderful! Thanks so much. I had a beautiful subject to work with! I’ve sent you an email response. Would love to try to connect. Beautifully rendered and painted – and a great idea to sketch this kind of exhibit. I’m really challenged by capturing the drape of clothing. Might be time for a visit to the local textile museum:-). You could also practice on hanging towels or clothes in your closet…but a textile museum would be fun, too. Thanks for commenting. Very fun!! Thanks for sharing!! Amazing – the work that was done back then…. Isn’t it incredible? There is so much handwork on these dresses– fantastic artistry in itself. I love Victorian clothing. I appreciate you “branching” out. That was terrible, yet I am leaving it. Thanks Lisa. The rich texture and folds of cloth give way to bare branches and bark this week…I’m back to my usual pursuits. But I enjoyed my Victorian foray very much. It makes me imagine how everything was one colourfull scene. Thanks Vee…I find it sort of hard to imagine a world of long gowns every day! HI BEAUTIES! TODAY WE’VE GOT THE VICTORIAN ONES. ENJOY!